Is there a more faddish furniture style from the 1970s than the beanbag chair? Such an inviting item for kids to crawl onto for play or watching TV. Such an unforgettable feeling – that squishy vinyl surface – nothing natural or biodegradable, inside or out. And how many kids were curious about all those pellets inside? Did any adult over age 30 ever look good lounging in one? Unsurprisingly, the ultra-mod beanbag chair sprung from high-minded hippie-influenced late-1960s radical design ideas. The original beanbag was Italian and made of leather. The mass-produced 1970s knockoffs were inevitably cheap vinyl. This Sears page shows the beanbag at it’s apex, in a range of oversaturated colors (including our 1970s friend “avocado”) that look practically edible, like giant gumdrops or jelly babies. Or maybe this moment is just past the apex and beginning the downward slide, since Sears was now also selling beanbag chairs SHAPED like chairs — which misses the point entirely and takes all the fun out of them. Amazingly, Both Sears and beanbag chairs are still clinging to life. 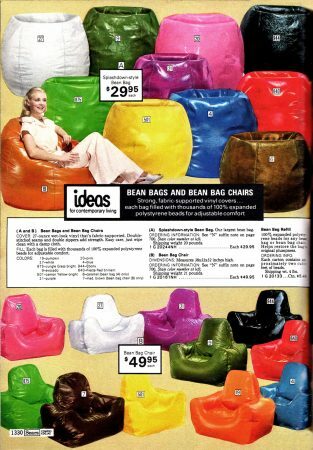 You can buy beanbags at Sears, although prices have doubled in 40 years.